Salzburg - Eduard Heinrich-Haus i Salzburg, Austria: Bestill nå! 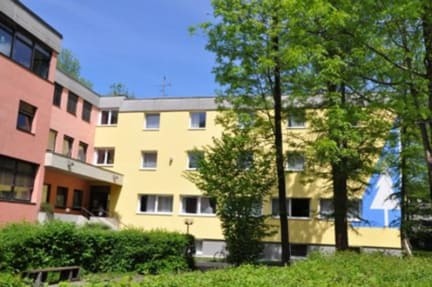 Peacefully located close to the River Salzach, a 25 minute walk from Salzburg's Old Town, the hostel is the ideal spot to visit the city's sights. Rooms have 1-6 beds, most with private bathroom, and facilities include TV room, cafeteria, a large garden, and a kitchen serving lunch, dinner and packed lunch. We also have WLAN and internet access in our friendly cafeteria. TV lounge, table tennis, outdoor chess, volleyball and a large terrace with a barbecue guarantee a holiday not to be forgotten. A washing machine and tumble dryer are also available. For non members we add Euro 3,-- per person per night for welcome stamps. 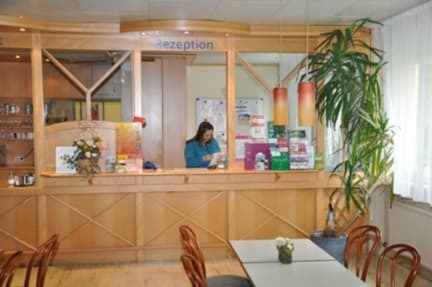 Our Hostel is open daily from 07.00 – 10.00 a.m. (Check-Out) and from 17.00 – 24.00 p.m. (Check-In). bis auf ein defektes Waschbecken waren wir sehr zufrieden!